Russian drivers do not always follow the rules: They drive on the roadside, attempt perilous overtaking maneuvers and may even try to "teach" perceived offenders the principles of good manners. The winter season sees a significant rise in the number of collisions. RIR has selected five examples of common incidents on Russia’s roads arising from a lack of respect for the law. One of the principal dangers on Russian roads is snow. The road services are not always capable of clearing snow in time, while black ice and careless driving also lead to accidents. Experts say that many people do not ‘separate’ their driving style into winter and summer modes. "The habit of more aggressive driving in the summer impedes drivers from driving more carefully in the winter," explained Alexander Kaminsky, co-owner of the Safe Driving Center, on Auto Radio. "Asphalt forgives things that snow and ice do not. That is why there should be only one mode of driving all year around: winter mode." Truck drivers, who often violate driving rules in the summer, frequently cause accidents in the winter. The braking distance is longer on a snowy or icy road, while the trajectory of a vehicle’s movement cannot always be predicted. "Recently we were driving in the south of Russia," says Bella. "You could see truck drivers with trailers racing along at over 100 kilometers per hour, passing each other and even small cars. Perhaps it wouldn’t have been so frightening if the road hadn’t been covered with snow and ice." Russian drivers frequently speak contemptuously about cyclists on the road, while bike lovers complain about drivers who do not notice them. While in the last 10 years more and more cyclists have appeared on Russia’s roads, there are still no bicycle lanes and cyclists are often inattentive and do not protect themselves, for example, with helmets. "Cyclists or scooter riders do not even wear bright clothes or those with light-reflecting strips," says Alexei from Moscow. "They don't always wear helmets. And when they turn they don't warn in which direction they are going. I'm a taxi driver and I often get into accidents because of the two-wheelers." "We practically don't have any bicycle lanes and we have no other place to ride but on the roadsides," explains cyclist Roman. "Drivers think only about themselves, as if no one or nothing else exists on the road. I've never been in an accident, but I've learned to be very careful, and I always wear my bright backpack so that everyone can see me. To be honest, I don't wear a helmet, but my son always does." You can find really odd situations on the road. The inventiveness of Bogdan Yevseyev, a 43-year-old Siberian resident from the Kemerovo Region, can be viewed as a blessing or as dangerous driving. One of the tires on his car blew out one day during a journey. But instead of changing it or calling for emergency assistance, he took a children's sled out of his trunk and tied it underneath the tire. Since there was a lot of snow on the road, he was able to make it to a local mechanic without causing any accidents. 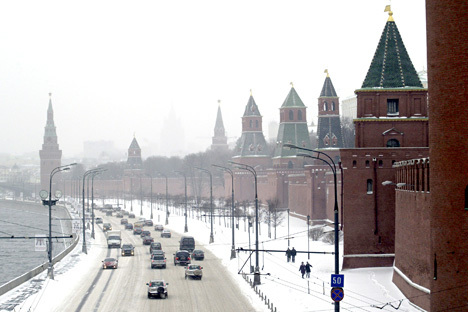 According to a survey held by the Public Opinion Foundation, 30 percent of Russian drivers are themselves disturbed by the boorishness of other drivers. "Several years ago drivers would even settle their conflicts with baseball bats," says Oleg. "I'm a former military man and therefore trained in handling conflicts. That is why in the last couple of years I've been able to take away about 10 pieces of such sports equipment. Even if drivers don't fight, they park their cars in a way so that no one can get through, which also shows their attitude to other people."